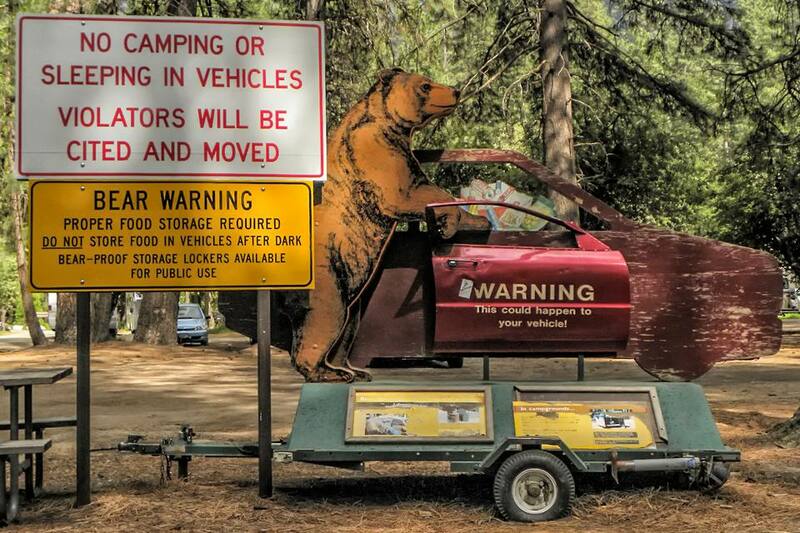 Bears can be a problem for campers in Yosemite National Park and Sequoia-Kings Canyon National Park, where bears frequently break into parked cars. In fact, they damaged more than 1,300 vehicles in Yosemite alone in 1998. Things have gotten better since then with only a few dozen incidents reported each year, but precautions are still essential. You can keep yourself, the animals, and everyone else safe by following these precautions which are written for Yosemite campers, but also for anywhere in the California Sierras. Bears are generally shy creatures that stay away from humans. Once they've tasted people food, they can't resist it. They have a keen sense of smell. They can smell food even if it's wrapped in plastic and locked in your trunk. And this astounding statistic was posted at the Sequoia National Park visitor center: Bears can smell food as much as three miles away. Bears know what ice chests look like and may try to break into a car even if the ice chest is empty. Bears are also strong and can easily break vehicle windows, bend car frames, and pop open camper shells. To get into a trunk, they will even enter the passenger area and claw through the back seat. Don't think you can outsmart a bear when it comes to leaving things in your vehicle. Never leave food or scented items inside a car at night. Infant seats and child seats almost always smell like the food their pint-sized occupants have dropped. With their keen sense of smell, they can smell even the tiniest amount. And don't stop with food. Some cosmetics and sunscreens — think peppermint lotion or banana-scented suntan oil — smell like food, too. So do canned drinks, chewing gum, baby wipes, and empty food wrappers. When you're clearing out the car, check underneath the seats, in the glove box, and the center console. If you've got a minivan, be especially careful. The U.S. Agriculture Department's Wildlife Service reports that bears break into them more than any other type of vehicle. Besides all that, park rangers who find cars with food in them after dark may impound your vehicle. A bear will enter a campsite even if people are present, so take these precautions even if you're not going anywhere. Follow the tips above about getting things out of your car. If metal bear boxes are provided, use them. Put all your food items in them, along with anything else that might smell like food. Latch the box completely. If no boxes are available, seal everything in plastic to contain odors. You can also buy bear-proof containers at retailers like REI. If you're camping in an RV, the Yosemite website suggests that you keep food out of sight in hard-sided trailers and RVs. Close the windows, doors, and vents when you are not there. If there's a bear-proof locker nearby, put the smelliest items in it - the inconvenience is small, but the cost of damage could be high. For soft-sided campers, use the same precautions listed above but get it all out and into a bearproof container. Cabins aren't immune to break-ins. Follow all of the guidelines for campers. Close and lock all the doors and windows when you're not around. Keep the door closed when you're inside. Place all garbage in a bear-proof dumpster or trash can. It's a common-sense precaution to keep yourself safe from bears and the trouble they can cause, but it's also the law. If you're hiking or backpacking, don't think you're smarter than the average bear. They can defeat any attempt to hang your food in a tree. Instead, store it in portable canisters, which weigh less than three pounds and will hold enough food for up to five days. If you don't have one, you can rent them from any staffed wilderness permit station. If you encounter a bear while hiking or camping, don't approach it, regardless of its size. Act immediately: wave your arms, yell, clap your hands, bang pots together, throw small sticks and stones to scare it. If you're with other people, stand together to look more intimidating. Keep your distance and don't surround the bear. Give it a way to escape. Be especially careful with a mother bear who has cubs. And don't think about taking bear pepper spray along to Yosemite: It is considered a weapon and isn't allowed there. If the bear took some of your belongings or food, DO NOT try to get them back. Report all bear encounters to a park ranger right away. That's important even if no one was hurt because it helps them know where to spend more time patrolling. For more tips about bears in the park, you can visit the Yosemite National Park website.